For the United States, Loic Wacquant2 distinguishes between the « community ghetto of the immediate post-war era, compact, with clear limits and grouping together all black social classes » (my translation) and the hyperghetto. The latter replaced the community ghetto beginning in the 80′s due to an « exacerbation of the excluding logic of ghettoes » (idem), meaning the withdrawal of private and public services, the departure of the middle classes and those of the working class who still had a steady job. 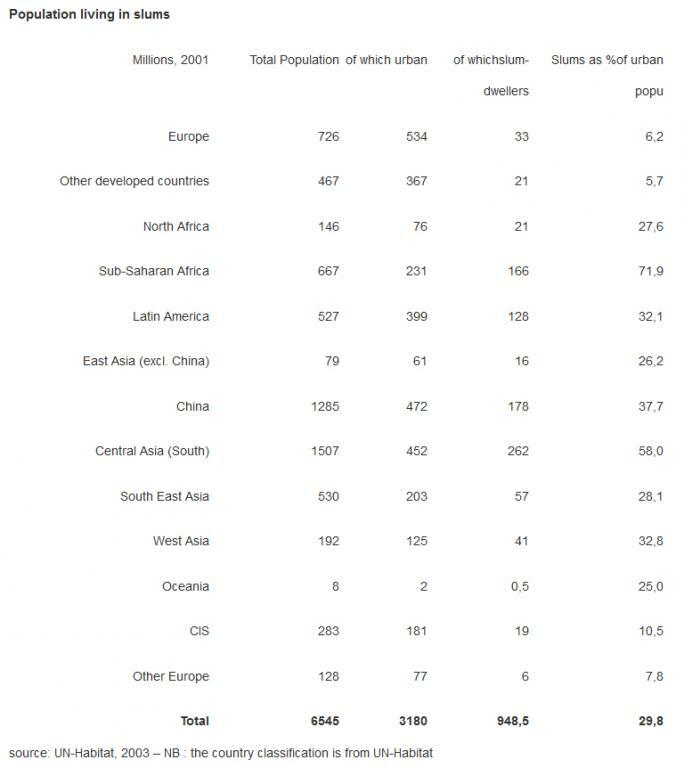 We should note that the ghettoes, old or new, are not slums proper, but are probably included in the above slum statistics. Janice Perlman, who studied the favelas, makes the distinction between an « ancient exclusion » based on the illiteracy, very low income and rural origin of the favelados, and a « new exclusion », from the 80′s on, involving new generations of better educated, more consuming people who nonetheless experienced « problematic integration into the labor market ». The favelas she observes today have improved significantly from the point of view of housing quality and services such as water and electricity. They constitute an active real estate market. She nonetheless considers that the residents’ lives are worse than before, especially due to drug-trade related violence. Authors also indicate that the change in the modalities of capital accumulation during the 80′s brought about a change in the slum-dwellers’ origins. From that decade on, an influx of people from the wage-earning classes in town centers moved to the slums because of a combination of employment and housing crises. During that phase of globalisation, agriculture in developing countries faced a crisis due to farm subsidies in developed countries. This crisis was compounded by the SAP-induced industrial crisis which destroyed the import-substitution industries that had been painfully set up during the decolonization era. As wage workers in the formal sector lost their jobs, they could no longer keep their housing, all the more in that real estate speculation became a massive outlet for the local capitalists’ investment. Old slums have often been erected on squatted land in a militant way and defended against the police. A wave of such occupations occurred in the 70′s. Since then, even pieces of ‘slumable’ quality land have become a target for speculation. They are taken over more or less legally by investors, who then rent them out after having installed services on them, or just built shacks, or done nothing at all. Shack rental comes in many informal ways, but is more and more the rule in slums. Free occupation is the exception. Squats are only tolerated on land nobody is interested in (too humid, too sloping, too polluted…). The only rent indication I found concerns a slum in Nairobi: a shack was rented for $6 per month. ★ Who owns slums? How does the housing market work in slums? ★ What are the economic mechanisms of slum reproduction? Who works for whom? Where are the workplaces located that employ slum-dwellers? ★ Which NGOs intervene in the slums? What do they do? Whether « what rioters thought » of their riots could cast much light on the historical meaning of the event is debatable. Nevertheless, Pithouse is right when he insists that Mike Davis completely overlooks the fact that slums are places, not of passive exile, but of fully-fledged social life. Davis has accumulated hundreds of monographs to « prove » this exclusion and the destitution of those excluded. He could just as easily have found hundreds of articles referring to slum-dwellers’ struggles and resistance. And report on them to us. We would have observed slum-dwellers struggling for land, water, electricity, schools, sewers, clinics, etc. We would have learned that slum-dwellers know how to organize when necessary, that they have political (and religious) opinions. We would have seen slum-dwellers resist the police and town planners. Thanks to his brilliant intelligence and his vast documentation, Mike Davis would have shown us that this resistance and these struggles are part of social relationships within the slums, that hierarchy and classes exist in the slums, with bosses and proletarians (maybe not always? ), and that the slum-dwellers’ resistance struggles sometimes have to be analyzed on a inter-classist basis. Contrary to any frontist tendency, we would have observed slum proletarian rising up in a multitude of riots. Neither Davis nor Wacquant studied riots in depth, though riots are frequent in the social categories they focus on. The reason is that these riots are silent for them. Almost by definition, riots do not convey any political messages, nor do they reject the political message that some try to impose on them. They are often self-destructive, which doesn’t mean absurd. They seem repetitive and always the same, so much so that they appear to be a ‘natural’ attribute of slums and ghettos. But for those who care to listen, their message is meaningful, and it has evolved recently, as they begin leaving their slum base, as we shall see in Bangladesh. In Tangier at the end of the 20th century, a small slum close to the city center called Haouma Nçara 6.was the site of a ‘rehousing’ program designed to free space for developers. ‘Rehousing’ consisted in relocating the slum-dwellers to other areas where they would supposedly be more comfortable. The program was prepared far in advance and negotiated with the residents. This Tangier program was meant to be a model of democratic treatment of slums. Even before the announcement of the program, the residents had already an organization, with a chairman in charge of relations within and outside of the slum and with the authorities. The organization naturally served to prepare the rehousing. General assemblies discussed the complex modalities of the operation. In the end, due to bureaucratic inertia, hierarchy within the slum and politicians’ intrigues, the rehousing was neither democratic nor complete (some inhabitants were not rehoused), and the rehoused peoples’ lives were significantly worse than before. Of course, the leaders obtained the best places on the new tract of land. The details are not important. I only want to give an example of slum-dwellers not being a mere herd, a human surplus in pure exclusion, but a social group with its internal life and contradictions (and I certainly don’t want to advocate slum self-management!). We would have liked for Mike Davis to use his formidable research and documentation capabilities to explore the links that surely exist between the slums around Dhaka (Bangladesh) and the series of riots which rocked the industrial areas of the town. Among the possible jobs for the slums’ young women, the textile industry offers the best in town at $30-$40 per month. Yet strikes, highway blockades, riots, and factory or car arsons are common in the recent history of the Dhaka textile industry. From 2006 on, not a year passed without a social explosion which brought anti-work to a degree unknown in the West in the 70′s. Though victims of massive, chronic unemployment, the women enlisted the help of men (rickshaw drivers, street peddlers) to burn the factories offering those precious jobs, thereby radically denying that the solution could lie in economic growth and job creation. This example shows not only that slum-dwellers are part of the global cycle of capital (80% of the textile output is exported), but also, and above all, that they take part in the most radical way in the critique of the present situation. Slums are not inward looking, nor are they longing for the return of the old working class movement. When there is work, slum-dwellers are only too happy to take it. But when they rise up, they may also say that they wouldn’t want it for an empire. After all, isn’t that very common? In his book, Mike Davis reports the curious encounter between John Turner13, an anarchist architect, and the World Bank. It was during the 70′s, when the World Bank faced the failure of its first experiments in the field of housing migrants flocking into towns. As for Turner, he was discovering the inventiveness of slum builders, the miracles of doing things with one’s own resources. He concluded that slums are a solution much more than a problem. For him, marginal help is sufficient as long as slum-dwellers are left free to do as they want. In their daily practice of self-construction, slum-dwellers are in the best position to adapt small resources to very varied needs. This results in housing forms which reconcile residents’ needs with financial and technical constraints much better than an architectural firm can. To replace slums with high-rise public housing is uselessly expensive. Their inhabitants don’t feel at ease, don’t consider these flats theirs and let the buildings decay rapidly. Maintenance costs add to the high costs of construction. The conclusion is that slum-dwellers must be left free, with minimum aid (land servicing for example). No norm, no planning permission must be imposed. A micro-loan may be enough to help buy some materials. The World Bank drew on these ideas and saved itself money. But the loans the Bank offered to slum-dwellers were far too expensive. Such programs were finally used to house better-off social categories. 1. Tom Angotti (quoted by Richard Pithouse, cf note 4) sees ‘racialized connotations’ in the word slum. The reader will hopefully admit that there is NO such innuendo on my part, and that I use the word for its simplicity. 2. Loïc Wacquant: Urban Outcasts: A comparative Sociology of Advanced Marginality, 2008. 3. Hernando de Soto is a well-known partisan of this idea. During the 80′s and 90′s, he elaborated the notion that it might be sufficient to grant slum-dwellers a tradable State-guaranteed property deed corresponding to their piece of land to transform them into active capitalists. Such titles would serve as security for loans for investment purposes. The kind of investment is not important: De Soto considers that slum-dwellers are so resourceful they can make a profit out of almost nothing. 5. The same remark may apply equally to Loic Wacquant’s Parias Urbains. In spite of his knowledge of his subject from the inside (unlike Davis), Wacquant cannot do more than mention riots, without letting rioters express themselves. 7. Pedro Arevola : Huaycan self-managing community: may hope be realized, in Environment and Urbanization, vol. 9, n°1, p. 59sq. 11. Leo Zeilig, Claire Cerruti : Slums, resistance and the African working class, in International Socialism n°117, Dec. 2007. 12. Bruno Astarian : Le travail et son dépassement, Senonevero 2001, pp. 74 sq. Mike Davis completely overlooks the fact that slums are places, not of passive exile, but of fully-fledged social life... to “prove” this exclusion and the destitution of those excluded... He could just as easily have found hundreds of articles referring to slum-dwellers’ struggles and resistance. I also disagree with the author's interpretation of Bangladeshi garment workers struggles; (s)he seems to define them as at points becoming 'non-demand' based ... This sounds to me like a possible projection ... of one's ideological preferences/preferred conclusions - of what one wants to find confirmed in events. 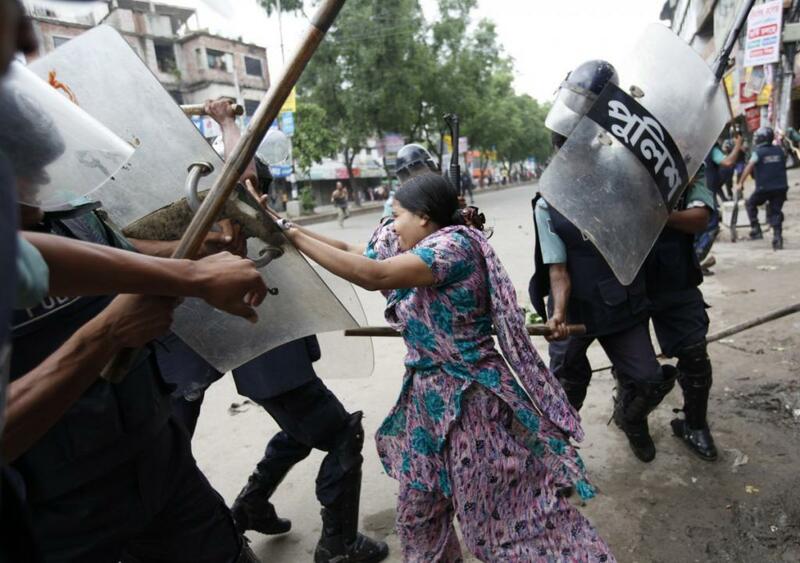 ... All the struggles in the Bangla garment sector I know of are demand-based (as are the examples given in the article); demanding payment of arrears, demanding re-employment after lockouts, demanding an end to management brutality, demanding a minimum living wage etc. To define their general character as anti-work is unconvincing to me; one can find news interviews, filmed in the midst of these violent protests where workplaces are attacked, with workers saying they are acting to demand payment of arrears and/or against brutal conditions, or they are protesting lockouts and being prevented from working. Destruction of factory property is seen as a bargaining tool - 'you don't give us what we want/are owed, we'll make you pay' - "collective bargaining by riot". The anti-work angle is no more than one possible aspect, latent rather than any predominant defining characteristic. Yeah, in Bangeladesh workers werw rioting for work in some cases as they were locked out or plants were closed. Far from being anti-work, they demand work and pay. I'm continuously shocked that the communizers not only ignore this fact but continue to perpetuate the opposite! When there is work, slum-dwellers are only too happy to take it. But when they rise up, they may also say that they wouldn’t want it for an empire. After all, isn’t that very common? This is not only flatly wrong but extremely romantic! A dillusional fantasy. Astarian fetishisizes a gross caricature of the so-called "surplus population" and "slum-dwellers" similar to Moaist third-worldism. It also reminds me of the "noble savage."